Game of Thrones star, Hafþór Júlíus Björnsson, who portrays the character The Mountain has been named Europe’s Strongest Man for the 5th time. 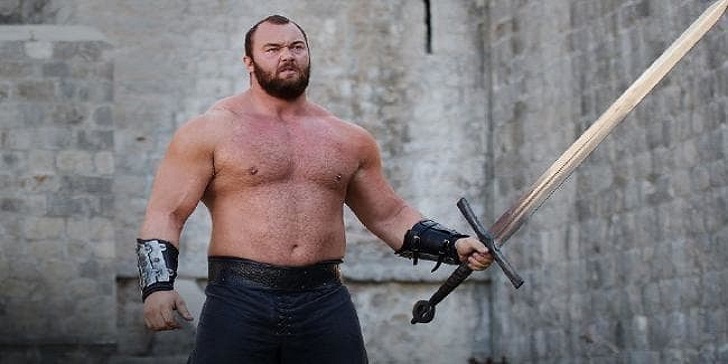 The 30-year-old actor and fitness enthusiast plays The Mountain, in the HBO hit series, which returns to screens on April 19th for its highly-anticipated eighth and final season. Mountain was victorious at the competition held in Leeds and paid tribute to his team and to his country, Iceland. Europe’s Strongest Man for the fifth time! So blessed to have such great people behind me! Team Iceland baby. Huge thank you to all my family, my beautiful wife and all my friends for all the help and support!! The Mountain dead-lifted an astonishing 770 lbs (349.26 kgs), for ten consecutive times. Björnsson then performed the log lift challenge, an Atlas stone lift, the tire flip, and then the ‘pillars of Hercules’, where the competitor pulls two chains in order to avoid two 350-pound-plus pillars from falling down. I have to eat every two hours to maintain myself. The Season finale for Game of Thrones starts from April 19.